This was shared by Jason Shull and it was honestly a surprise to everyone he told about it. As some of you may know there were plans to hold the a National OA Meeting in 1942 and apparently one of the places that was strongly considered as the host site was Cheraw State Park just a few miles down the road from Camp Coker in the Pee Dee Area Council (Santee Lodge 116). 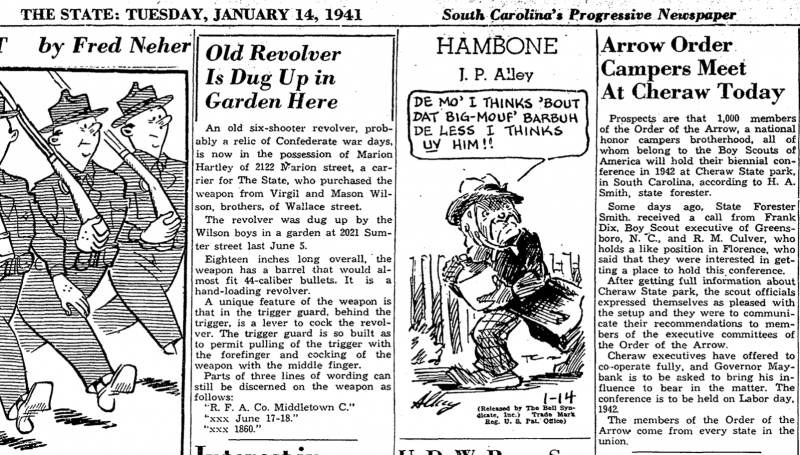 The article mentions the name of the Pee Dee Scout Executive at the time along with the Executive from Greensboro. Some of you can add details here but essentially as I understand it the decision was made to hold it at UNC-Chapel Hill but then the whole event was called off. Whether it was because of the ongoing war (likely) or other reasons who can say.